Pickups parked at Lowe’s site Tuesday afternoon. 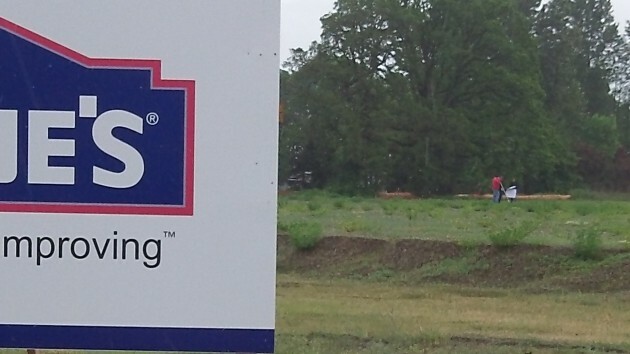 It looks like things are about to get going on the Albany site where Lowe’s plans to build a 125,000-square-foot home improvement and garden center. The city of Albany’s building permit for the project has been ready since Friday and on Tuesday was still waiting for a company representative to pick it up. Building Official Gary Stutzman says that for purposes of the permit, the project is valued at $16,045,000. Building permit fees and other charges — mostly other fees including systems development charges — totaled $609,852, according to Stutzman. A chunk of it has already been paid, he says, leaving a bill of $550,104.51 when the permit is picked up. Among other items, the bill includes $9,300 in state fees, $25,000 in school construction taxes, and about $444,000 in city systems development charges. 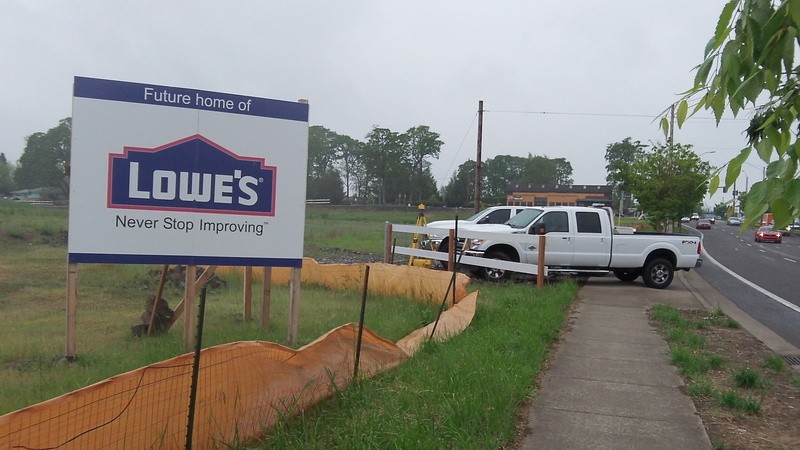 After I talked to the city building official on the phone Tuesday afternoon, I drove into town for an errand and passed the Lowe’s site at Ninth Avenue and Oak Street. A couple of pickups, one of them from Pacific Excavation, were parked at the 12-acre property off Ninth, and in the distance, three men were walking the site in a light drizzle and consulting what looked like a set of plans. Woo Hoo! Let’s hope they set a land speed record getting this store up and open for business. Now all they need to do is find several 250 year old oak trees, transplant them to re-establish Hackleman’s Grove, and leave town for good.